Our 13 hens came home to us a few nights ago, a little spur of the moment. So, a hill-billy train? Indeed, it was. 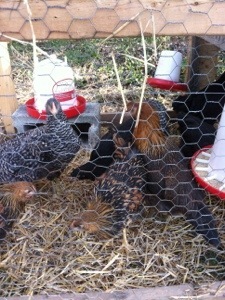 My neighbor Mel has graciously been keeping our 13 chickens in her barn. She raised them from chicks, because they came right around the time our little farmer came. So, 14 babies at our place was a crowd. The plan all along has been to move them over to our property once the high tunnels were completed, so they could hang out in there, and till the soil for us. Unfortunately, there have been some unforeseen delays. And since the weather is FINALLY nice, it’s time to move them outside. 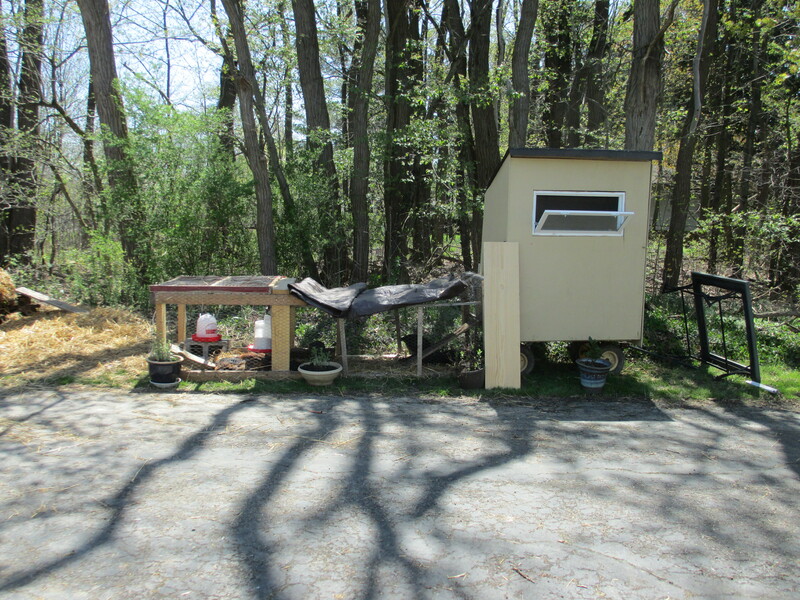 So, Mel had a spare, mobile coop she let us borrow in the meantime. Getting said coop and chickens three doors down, on a busy street in the ‘burbs is something not to be missed. So, let me paint you a picture with, well, pictures. 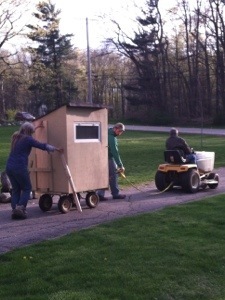 Here we have Joe, Mel’s husband as the engineer, Farmer Rich, is steering the coop, and Mel is stabilizing it. I think it was at this point that I was giggling uncontrollably, and Mel shouts out “It’s a Hill-billy train! !” with her slight Texas accent. I, on the other hand, am of the hardy stock of central Pennsylvania mountain folk, and generally prefer “hick from the sticks,” but in this situation, the “hill-billy” in “hill-billy train” hit the nail on the head. Where am I, you might ask? 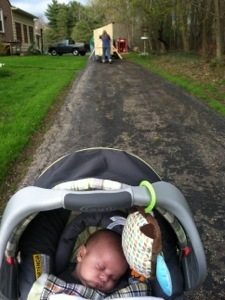 Besides taking pictures, I was bringing up the rear with RJ in the stroller. It was a sight, indeed. It was a fun time. And, now the girls are home, and enjoying the new, temporary digs. So, a BIG thanks to neighbor Mel for everything! 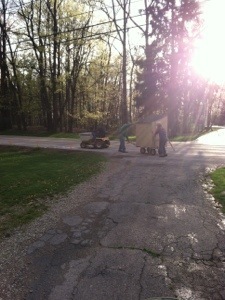 What we won’t do for our chickens! !